Not all of us are gifted with the skills of famous ‘dog whisperers’ who can somehow magically transform even the most vicious pooch into an obedient, peace-loving, and highly well-balanced canine. Because we want our dogs to behave in certain ways that will also not embarrass us in our respective neighborhoods while also earning the respect of our peers, training our pooches to become responsible and sociable members of our own families have become an important aspect of being a pet parent. Unfortunately, hiring the services of so-called dog behaviorists, canine handlers, or dog trainers can be expensive. This is where dog training books can help. For just a few dollars we’ll gain a much-better understanding of how to become better pet parents for our dogs. Best of all, we can read and reread these literature throughout our lifetime. It is, thus crucial to choose the best dog training books that will help us achieve our goals. Here are our picks. 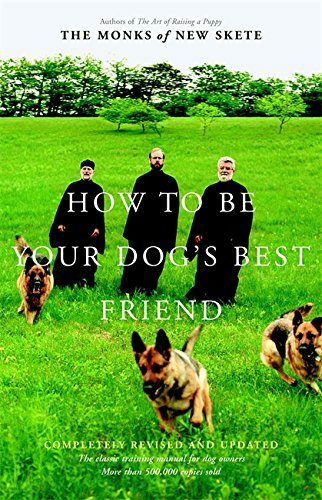 Considered as one of the leading authorities in puppy training books, the Monks of New Skete truly have an uncanny way of communicating the essentials of dog training. They’ve been sharing their expertise on the man-dog relationship, canine behavior, and dog training for more than 3 decades. 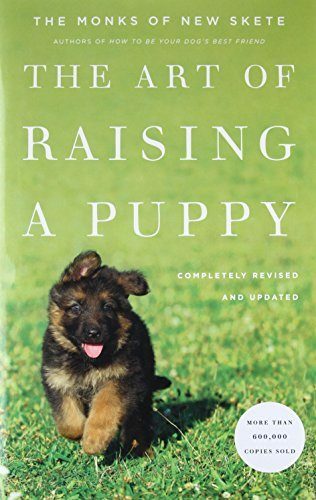 Their book The Art of Raising a Puppy is considered as one of the most authoritative, albeit written in a very fun and entertaining way, literature when it comes to raising pups. This is important since all of the foundational elements can be found in puppyhood. The success of your pooch as an adult dog largely depends on how well it grew up from being a puppy. The Monks of New Skete share with you their personal experiences training German shepherd puppies and the pups of many other breeds so you can feel more confident that your pooch will grow into the best dog it can be. Some canine training books only teach you certain aspects of the endeavor such as clicker training and other things. 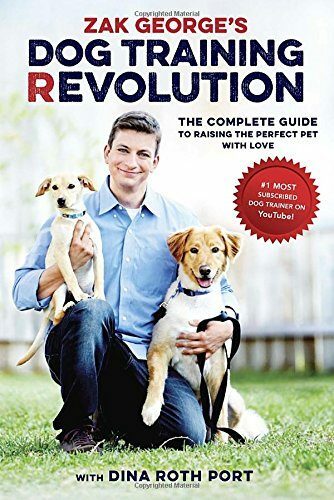 The Zak George’s Dog Training Revolution: The Complete Guide to Raising the Perfect Pet with Love, on the other hand, gives you all the essentials you’ll need to become a better pet parent. This how to train your dog book talks about everything from picking the right puppy to add to your family, housetraining your pup and engaging it in basic obedience training, and even managing certain doggie behavioral issues like nuisance barking, jumping up, leash pulling, chewing, biting, aggression, and many more. George and Port also managed to include topics on veterinary care, canine nutrition, as well as tips and tricks that will enhance your relationship with your pooch. You can always look at the Dog Training Revolution as one of the best rated dog training book titles. Don’t you just adore pooches that know how to operate the TV remote control or even open the ref door to get the food it wants? Well, if you keep on reading one of the best rated dog training book in the market, the 101 Dog Tricks: Step by Step Activities to Engage, Challenge, and Bond with Your Dog, you might also be successful in making your doggie perform a trick that no other canine member can. 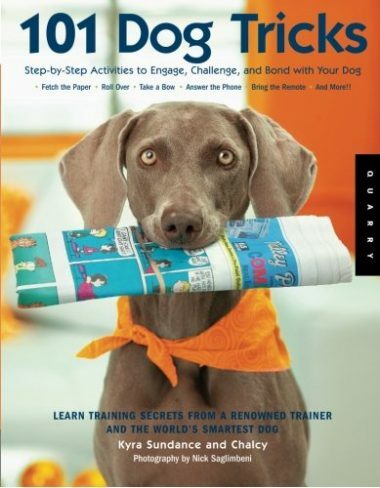 This Ney York Times bestseller penned by Sundance and Chalcy is every beginner’s guidebook to canine training, complete with colorful images that depict the easy-to-follow step-by-step instructions. It’s like Dog Training for Dummies except that this one is written in a more authoritative manner worthy of being translated into 18 different languages. It’s all about keeping and strengthening that bond that exists between you and your pooch through unique and fun activities. When it comes to canine obedience training, one of the most important principles is the use of positive reinforcement. 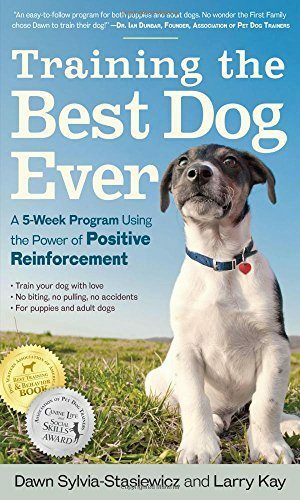 It is for this reason that we believe Kay and Stasiewicz’s Training the Best Dog Ever: A 5-Week Program Using the Power of Positive Reinforcement rightfully deserves to be included in the list of the best dog obedience training books. Training the Best Dog Ever is for pet parents who believe that their dogs have just about the same rights as any other member of the family, longing for care, love, affection, and kindness. Cruelty has no room in this kind of training. Any form of punishment is considered counterproductive. The TBDE was written to emphasize the importance of building trust and how a simple doggie treat can be used to win this trust. It talks about bonding not reprimanding or yanking on the leash. Kay and Stasiewicz provides a detailed guide on how a simple training program accomplished 10 to 20 minutes a day can cement the long-lasting friendship that have come to epitomize the dog as man’s best friend. Sometimes you don’t need to train your pooch the highly advanced stuff. What they only need to learn are the few fundamental commands that will keep them safe, secure, and happy. 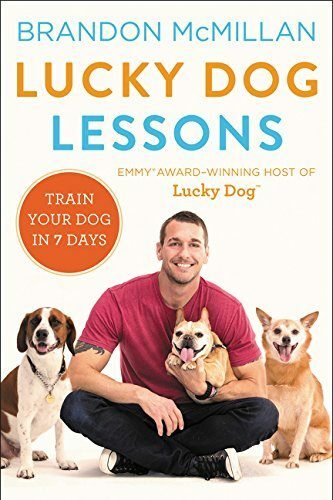 And for that, Brandon McMillan’s Lucky Dog Lessons: Train Your Dog in 7 Days can be a very valuable resource. This how to train your dog book introduces pet parents to McMillan’s 7 Common Commands that all dogs can master within 7 days. It doesn’t really matter how deeply troubled your pooch is as McMillan guarantees the 7 days methodology will work. Each command is presented in a very easy-to-follow manner complete with illustrations and images to further drive home the point. The basics of establishing trust, control, and focus are also provided in this best rated dog training book. Known as the definitive resource for dog training for more than 25 years, the Monks of New Skete’s How to Be Your Dog’s Best Friend: The Classic Manual for Dog Owners continues to provide both newbie and seasoned pet owners invaluable insights on how to train a dog. The principles, techniques, and methodologies employed by the group have been in place for more than 4 decades and they are sharing these with anyone who would like to strengthen their relationship with their respective pooches. Understanding is the key. This is the message of the How to Be Your Dog’s Best Friend. The literature has been the source of inspiration for all other books of the genre, making it truly one of the best dog training books you can ever buy. 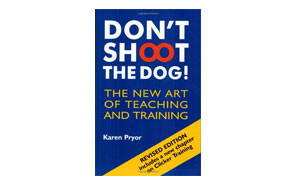 Another best rated dog training book that focuses more on the behavioral training of pooches is Karen Pryor’s Don’t Shoot the Dog! 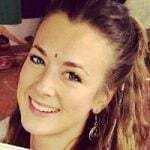 : The New Art of Teaching and Training. The book teaches pet owners on how to manage a variety of canine behavioral issues without resorting to yelling, threatening, forcing, punishing, or even – as she aptly puts it – ‘shooting’ your hapless pooch. 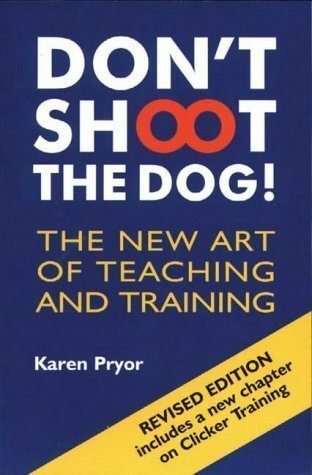 Pryor’s 8 signature methods for addressing any kind of canine undesirable behavior have been lauded for its more humane approach to canine training without inflicting harm, injury, or insult to the dog. It is more about using one’s affection to bring out the best in dogs. After all, they are very sociable animals. 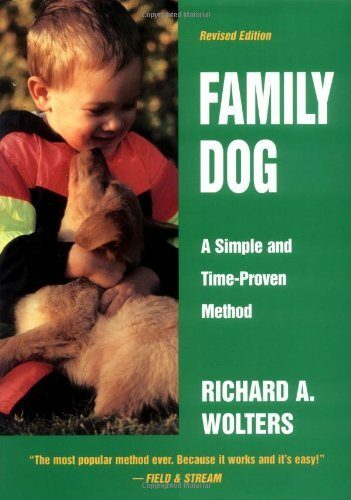 Legendary dog trainer Richard A. Wolters shares his knowledge and expertise in the effective training of any dog with his Family Dog: A Simple and Time-Proven Method. It is considered as one of the best dog training books since it only requires a few minutes of dedicated and focused yet fun training on a daily basis to train any pooch. 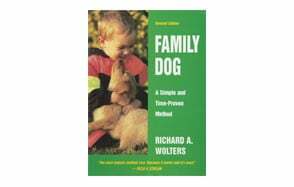 With not less than 200 colorful images guiding you every step of the dog training process, Family Dog simply washes away any apprehensions you may have about canine training as Wolters has done an exemplary job of simplifying the whole process for you. Family Dog talks about almost anything and everything that will make you a better pet parent, including training fundamentals, ensuring your pooch’s optimum mental development, canine play and relaxation, communicating with our pooches, grooming, nutrition, canine first-aid, and a whole lot more. Technically, Family Dog solidifies the position of your dog in your family. Not everyone can get into the SEAL program of the US Navy. Even the toughest men from the different branches of the armed services don’t make the cut. As such, if a dog makes it through the program, now wouldn’t that be a feat? In the book Team Dog: How to Train Your Dog – the Navy SEAL Way, one of our top dog training books, former US Navy SEAL operator Mike Ritland shares with us his experiences working with some of the finest canine units of the US military and how these principles can be easily applied in the training of pooches for ordinary households. Whereas Cesar Milan wants you to be the pack leader, Mike Ritland wants you to be your dog’s team leader. You’ll be fed with military jargon like ‘command and control’ as well as ‘situational awareness’ which should be quite fun and interesting to read. 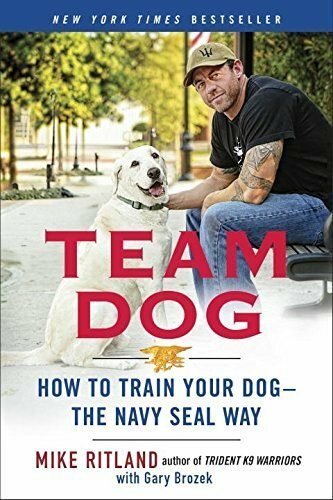 At the end of it all, however, you can always expect Ritland to give you selfless pieces of advice both from his personal experiences and from the canine training guidebook of the US Navy SEALs which you can use to improve your relationship with your pooch. 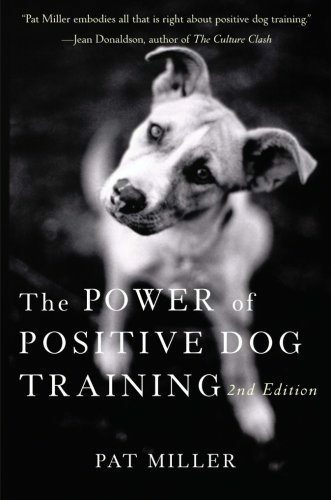 Whether you just got a new puppy that you want to teach new tricks, or you need to get a handle on your misbehaving dog, The Power of Positive Dog Training can help. With a six-week positive training program, Pat Miller, a dog trainer with over thirty years of experience, teaches you how to develop a real friendship with your canine companion, as well as a respectful relationship that is based on positive reinforcement. The absolutely best thing about this book? Punishment and fear have no place in dog training. Miller, the expert that she is, explains with simple and easy-to-understand language how to understand your pooch and respectfully instruct him/her to do or not do various things. To make the training process easier, the book has a progress-tracking diary, as well as a glossary of training terms. There are two things you have to understand before you start picking that dog training book to help you become a better pet parent. First, you need to appreciate how reading books can help you in training your pooch. Second, you need to keep a few things in mind before finally deciding on a particular title. Whether it is to teach your dog a trick or two, follow your simple command, or even manage a behavior that you think is growing out of control, dog training books can provide you with many wonderful insights on how to accomplish all of these things. The beauty of it all is that you can gain insight into a particular issue from the perspective of not one, not two, but a multitude of dog training experts. While you may not have the luxury of working personally with these renowned trainers and experts in dog training, you will still be able to gain an idea of each expert’s take on a particular training methodology. Here, you can actually compare different methods employed by various experts on any given canine issue. You will also be able to identify recurring themes in their training philosophies, principles, and methodologies. In a way, reading a variety of dog training books can help you create your very own perspective on what you can do with your pooch. Many authors will also provide you with tricks and tips, things that only they know about. A word of caution, though; these are highly relative. It doesn’t mean that since it worked for them it should also work for you. But it’s always best to try. More importantly, you will be able to identify which methods work and which ones don’t. The thing is that, while the methods described and explained in these pieces of literature have been tested on many dogs, there really isn’t any guarantee that your pooch will react in the very same way or that you will obtain the exact same result. Having books on dog training helps you narrow down the various training techniques and methodologies to create a program that is specifically intended for your pet. Training is all about patience and perseverance. Our pet canines, sociable and intelligent as they may be, operate on a different cognitive level as humans. For us, our memory recall is so great that we can somehow remember things that we did in the distant past. Dogs, unfortunately, are not really gifted with such a skill since a great number of them operate on a here-and-now principle. They learn the things that are pointed to them at that exact moment. That is why timing is very crucial in canine training since you don’t want your pooch to associate the behavior with something else. The point is that you can actually focus on a single aspect of your pet’s training one at a time until mastery has been achieved. Now, if you were to perform this under the supervision of a dog trainer or even as part of a large class, then you will have to consider them, too. While your dog may be expected to accomplish the different tasks that you want it to learn, you’d have to remember that it is you who will be in command of the training sessions. Having a dog training book allows you to read and reread every principle, every theory, and every single trick that is written and illustrated in these books. Compare that to hiring a dog trainer and you will most likely forget whatever he has taught you within a few hours. Unfortunately, it would simply be unforgivable to ask the trainer to repeat what he has already taught you. Books will not complain. So you can read everything back again until such time that you have already memorized every word on every line on the book. Don’t get us wrong; getting the services of a canine behaviorist or a dog expert to help you address some of the issues of your dog is highly recommended. Unfortunately, it is definitely not for everyone since it does entail a handsome price. So, instead of using the money to pay for their services, better invest in several good dog training books, read and understand these very well, and be on your way to implementing whatever it is you’ve learned from the books. 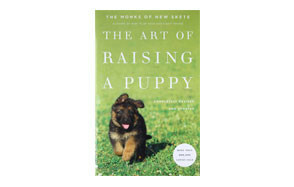 Picking the right dog training book can be a lot easier than picking a novel from your favorite bookstore. The reason is quite simple: you are already in a highly specific genre plus there aren’t that many authors who write about hound training compared to those who pen novels. Nevertheless, here are some things you need to consider when buying a dog training book. Revered dog trainers are a class of their own. Many actually do not write, preferring instead to provide personal dog training services rather than writing it down and having it published. But this doesn’t mean they cannot publish. They can still ask someone to write for them and have it published. Of course, there are also reputable dog trainers who write as well. The point is that you don’t want to buy a book penned by an author who is not really known for being a dog trainer. Credibility is crucial as the information you read in the book should be based on facts and not mere fiction. Different books cater to different pet parents. There are those that talk only about a particular training methodology while others are more general. This means that you have to get your priorities straight. Are you buying a dog training book to learn everything possible about caring for pooches or are you planning to read a book because of one very particular need. As much as possible you need to clarify your purpose for buying such a book. Not everyone can understand certain terms that only veterinarians or dog experts understand. While we do recommend going for highly informative and educational dog training books, it should also be entertaining and quite fun to read. More importantly, it should be very easy to understand. As much as possible illustrations, pictures, and images can help drive home the point and make learning and training execution a lot easier. Dog training books are invaluable resources in our pursuit of becoming better parents for our pets. With these best dog training books we’ve listed, we’re confident you will be more empowered than ever to assume your role as the pet parent of your beloved pooch. Aside from books, there are also some great online training courses for dogs you may wish to check out!